Retailers, there is a good chance that many of your brick and mortar customers and prospective customers are online. Not online to buy primarily, but online via social media like Facebook, Instagram and Twitter to belong. You know that because you’re on FB too. I received a call from a distraught business owner. 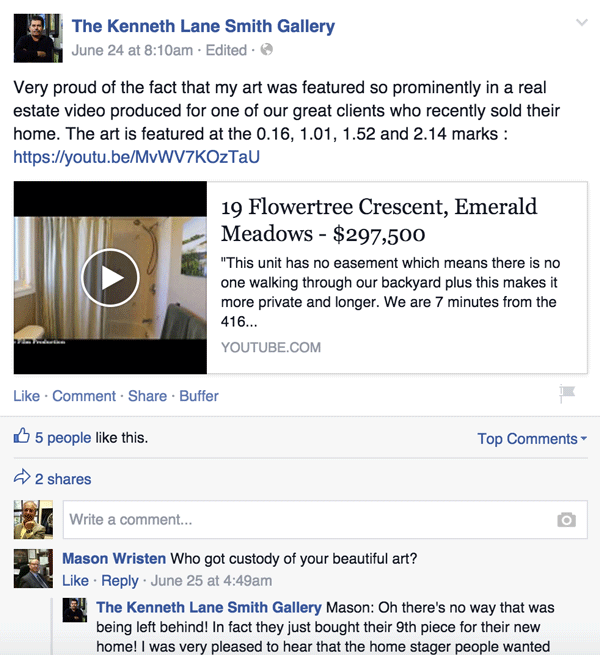 It seems his partner had a large FB following, but the business was bleeding money. When I dug deeper, the partner was using a contest app that had visitors like and share a daily post for a chance to win a $100+ item for free. Digging into the winners, these people weren’t even within their state! When looking to attract and keep paying customers, don’t use such contests repeatedly as you’re just playing Santa Claus to people who don’t care about your success. On the other hand...when you come up with great content that truly engages fans, they'll like, share and comment exposing their friends to your brand. 1. Use analytics to time and target your posts. The highest click thru, according to Sure Payroll is from 1-4pm with the highest on Wednesdays. The worst times? Weekends before 8am or after 8pm. 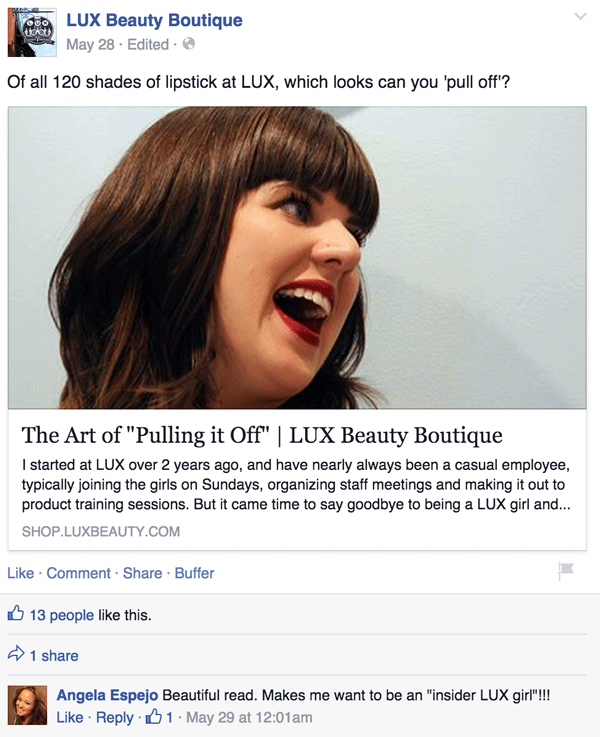 Dig into your Facebook page’s Insights, so you can find exactly what works for your brand. 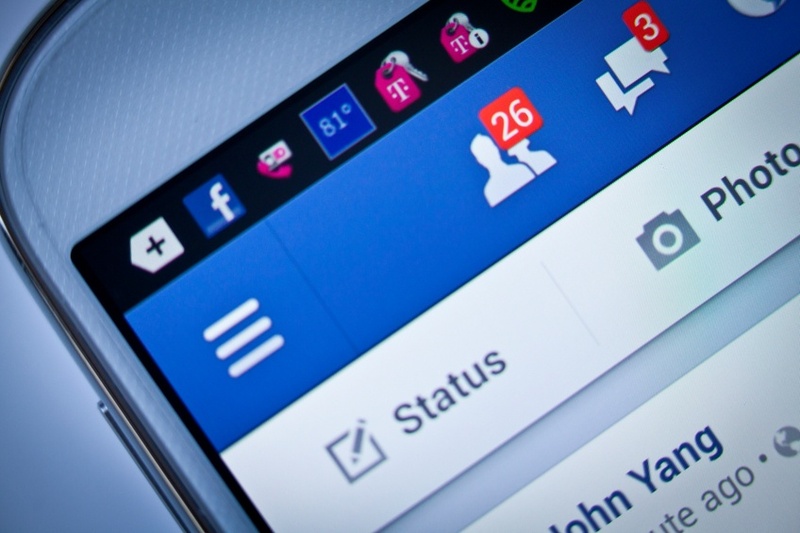 Attach a photo to any status update and get 2x more likes and 2x the comments. 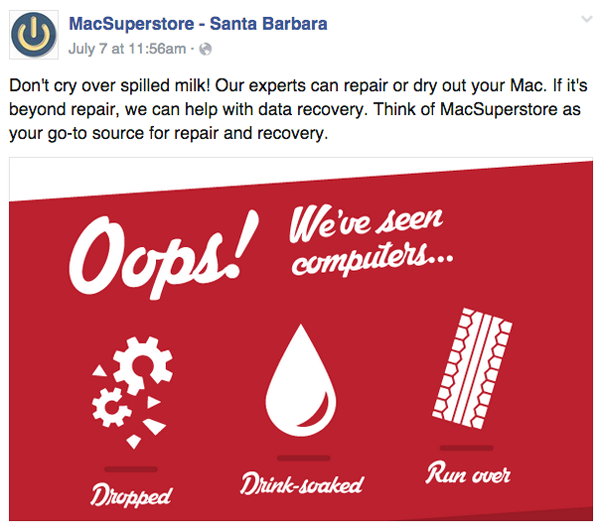 Yes, you can still ask a question, “What’s your favorite _____ of ours?” but adding a picture makes it much more noticeable like MacSuperstore in Santa Barbara shows below. 3. Make your posts fun. I can’t tell you how many times I see a retailer post a picture with a description i.e. Model 3838 from our Spring collection. Such posts result in few likes because there is no context, no creativity, and no effort to get the reader to engage. You always want to add one creative sentence that gets the reader to participate or comment. Bubbly Paws in Minneapolis is a pet store that also offers grooming. 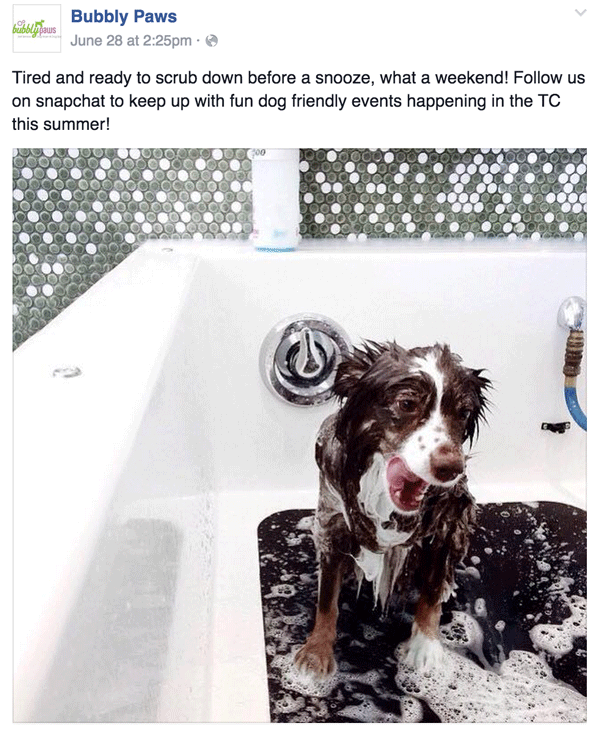 They share fun pictures of dogs being washed in their location. Who doesn’t like dog pictures? 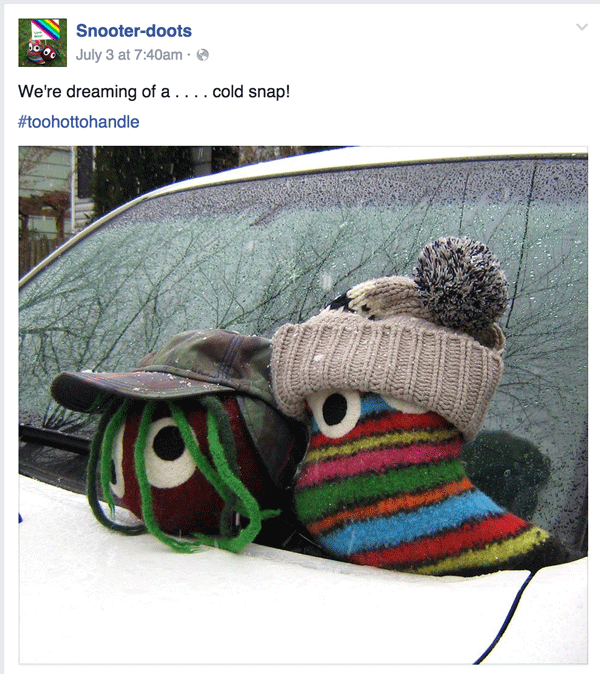 Gina McCauley with Snooter-doots has Lennie & Bruce act as their store ambassadors, spreading goodwill and high-jinks across the web encouraging folks to follow Snooter-doots to see what they've been up to. 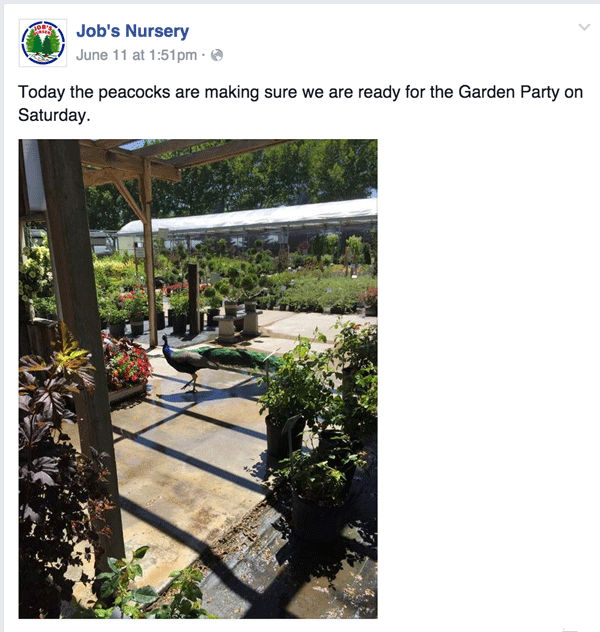 Lest you think it’s all about dogs, Alex Job keeps things lively at 75-year old Job's Nursery with fresh content about plants and weather conditions of the day using photos of his garden center’s cats and flowers to keep his community engaged. 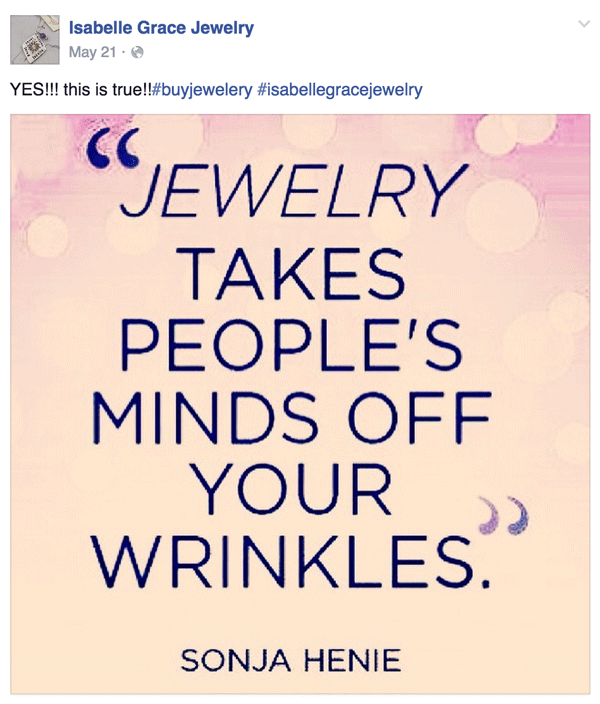 Isabelle Grace doesn’t just show off their jewelry designs, but they do it with a personality that brings a humanness to their posts; no wonder they have 20k fans. Jennifer le Grimm at LUX Beauty Boutique in Edmonton gets great response with her hashtag #BeTheBuyer campaign when she visits the NYNOW gift show. She asks for followers opinions, not just for a thumbs up or down on new products. She also shares personal experiences on their blog which gets traffic by posting on the FB page. 5. Show off to remove fear. 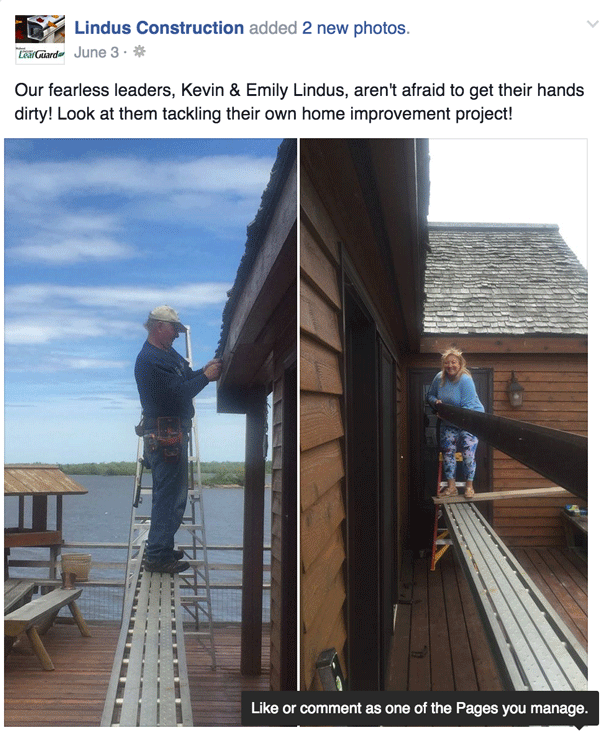 OK, they’re not a retailer, but if you do custom work, take a look at Lindus Construction. They show actual work they’ve done with videos to get potential customers over their fears of working with someone they don’t know. Pictures of satisfied customers and the guys who will actually be working on your home go a long way. And so do their 5 star reviews on their site. 6. Change up the types of content you share. 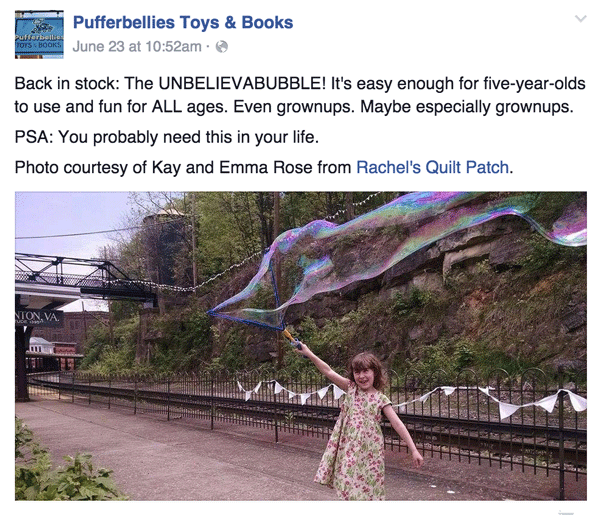 Pufferbeliies Toys in the Shenandoah Valley has been doing online media right for a long time including changing their page photos regularly, posting events, products, videos and more. They do it all with the assured voice of a small business person’s excitement for the new products they are carrying, the new projects they are creating, and the fun of running an indie business all while sharing with their tribe. 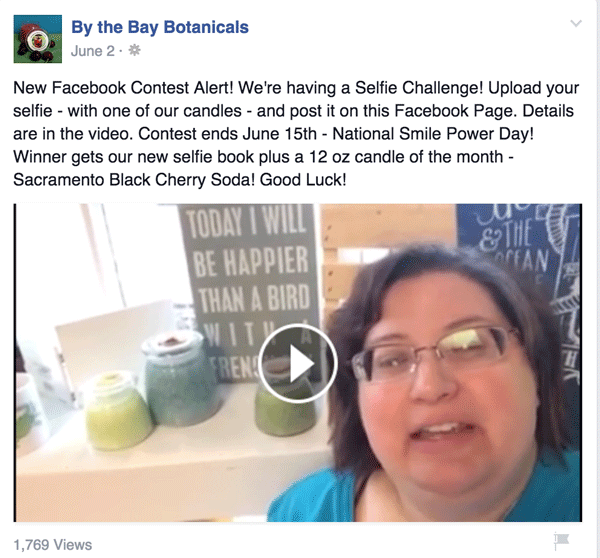 Michelle K. Sholund from By the Bay Botanicals has found the best reactions from her fans are store videos that do anything from thanking people for following her gift store on Facebook to showing how a product works, to behind-the-scenes stuff like goofing off. 7. Make your brand relatable. 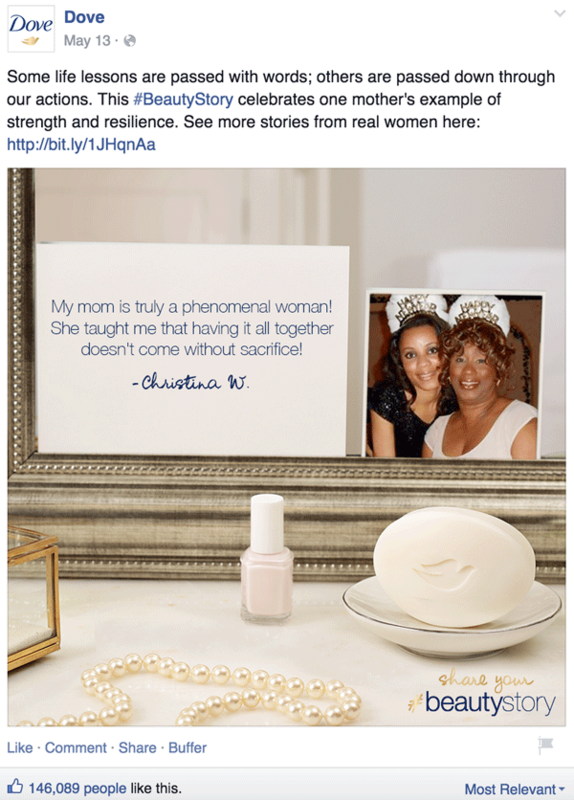 OK, Dove is a consumer brand, but it also has a great online community because they creatively get their message that being beautiful isn’t just skin deep as this example from Mother’s Day shows. Dove is successful because they can bridge their products with a continuing dialogue that tells a story. Instead of sales pitches, their posts are centered around the relatable lifestyle of their customers such as being a mother or father. 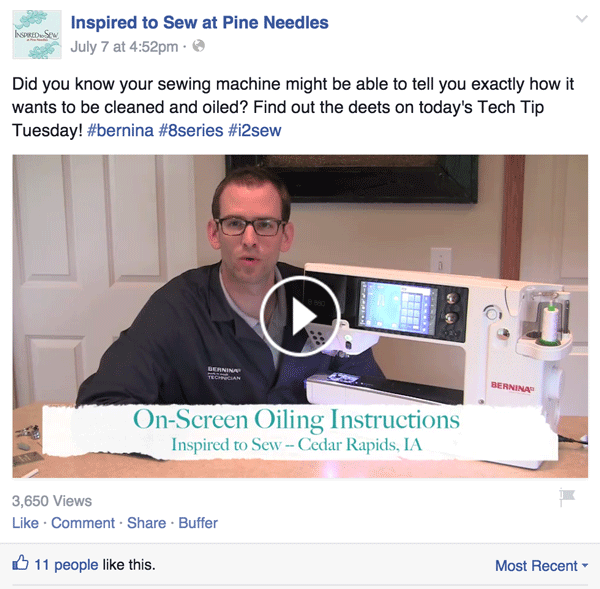 Jill Schlindwein Reicks’ target customers of inspired to Sew at Pine Needles who were late joining the ranks of FB. She educates her customers on what her store is doing with Facebook and uses that engagement to build community. “Like our classes in our store that teach sewing, we take our role as educators to bring our customers’ social media IQ up a notch. They trust us to explain things to them like SHARING and LIKING. As our customers are not watching a large variety of social media, we have our finger on the pulse to determine where they are in their learning. The messages we send are designed to match up our products with the personalities that we are working to reach.” They also have tech videos that take the fear out of maintaining your premium machine. Third party endorsements of satisfied customers are always good. This shoutout goes to photographer Ken Lane whose photographic and video posts show his customers’ excitement and pride when his art is delivered...leading to more buyers of his art. Renae Gonzalez owns Little Miss Everything, a children's boutique and party place. She’s found that posts that feature customers get the most likes. 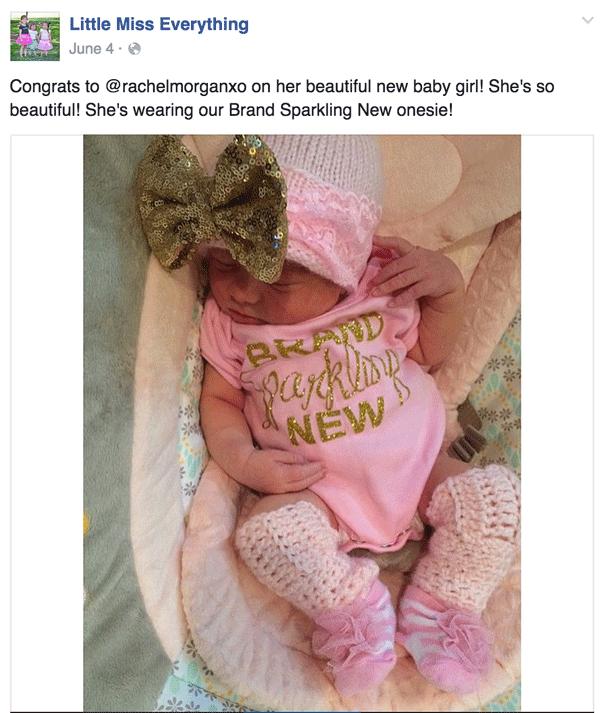 She has customers use hashtag #littlemisseverything and then she shares her customer photos. 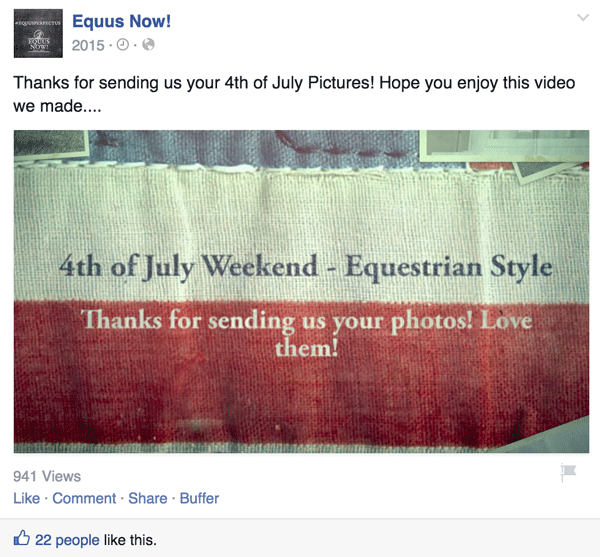 Rosemary Staeck and Equus Now encourages their loyal fans to send in their photos and then they make it into a movie like they did for the 4th of July or sharing a picture of their customer on a horse in London. 9. Solve problems your customers face. 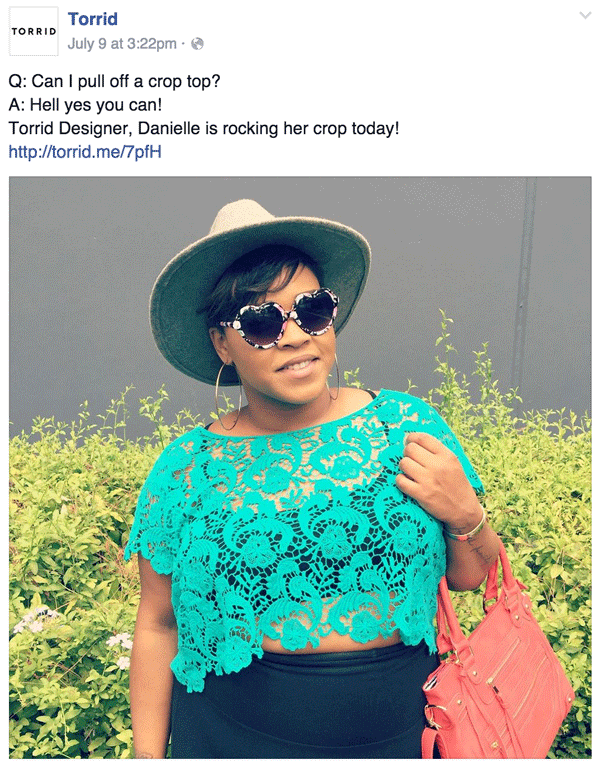 Torrid is a plus-size retailer for women. Their posts give fashion tips, not just product shots...and with a great attitude. Make your posts fun by adding a creative sentence that gets the reader to think, participate, or comment. Show off to remove fear. Change up the content you share. Show your brand as a person they can relate to. Solve problems your customers face. And it never hurts to encourage your paying shoppers to take a pic and post to your page or theirs. I know it’s a lot. Trust me, every day I’m trying to think what I can post for my 11K Facebook fans, and it takes work. But it’s not like having to do inventory; it’s bite-size with almost immediate gratification. Just bookmark this blog to help focus your social media efforts. Once you get the hang of bettering your presence on FB, you’ll want to learn more about their sponsored posts. Your brand is being actively discussed online anyway. Help the conversation along so you can hold on to those who like you, and then their friends will be exposed to what a great and genuine retailer you are.